Make the most of your week with our top 10 things to do with kids in Houston from Monday, April 22 to Sunday, April 28, 2019. 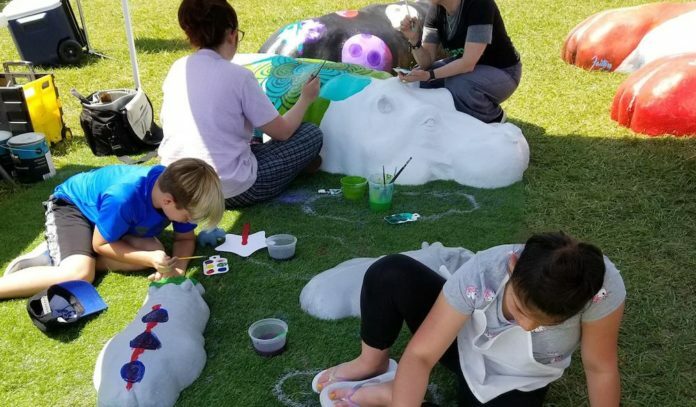 Celebrate the Earth, the return of the Sugar Land Skeeters, and enjoy several sensory-friendly family activities this week in Houston. Earth Day at Seabourne Creek Nature Park | Monday, April 22 | No Cover – Appreciate nature for all it is worth with a day of exploring Seabourne Creek Nature Park. You can help with prairie planting, take a walking tour, visit the bird sanctuary and butterfly garden, and spend time reconnecting with the great outdoors. 9am to 3pm. Explore Abilities Day at Children’s Museum Houston | Monday, April 22 – Spend a day at the Children’s Museum of Houston exploring at your own pace and taking in all it has to offer. This is a wonderful opportunity for kids with Autism Spectrum Disorders (ASD) and sensory processing differences to participate with their caregivers in activities like story time, seeing therapy dogs and more. The museum is closed to the public. Tickets are $5; free for current members. 10am to 3pm. Family Movie Night: Wonder Woman Movie Screening at Levy Park | Friday, April 26 | FREE – Calling all superheroes and their parents to Levy Park for a spectacular showing of the 2017 flick, Wonder Woman. Once Wonder Woman learns of the raging threat against the outside world, she is convinced she can stop it. Follow her on her adventure in this film that is rated PG-13. 7:30pm to 9:30pm. Autism Speaks 8k and 1K Kids Fun Run at Sugar Land Town Square | Saturday, April 27 – Lace up your sneakers and get ready to run (or walk) an 8K course through Sugar Land Town Square in support of Autism Speaks, which aims to raise awareness of the fastest-growing developmental disability in the country. Bring the kids to participate in the 1K Fun Run. Registration costs $30 for the 8K; $10 for the 1K Kids Fun Run. 7am to 11am. Houston Texans Kid’s Triathlon at NRG Stadium | Saturday, April 27 and Sunday, April 28 – Cheer on young athletes are they run, swim, and bike their way across the finish line at the Houston Texans annual Kids Triathlon at NRG Stadium. The largest sanctioned kids triathlon in the world aims to promote healthy exercise and physical activity for its sixth consecutive year. Ages 6 to 15. Registration is $65. Times vary. Texas Crawfish & Music Festival at Preservation Park | Saturday, April 27 and Sunday, April 28 – Crack open some mudbugs and listen to country music and crawfish as you unite for a weekend of family-friendly fun. Festival-goers can also expect alligator theme park Gator Country and a petting zoo. Tickets are $12 at the gate (ages 13 and up); $5 for children (ages 6 to 12). Times vary. Lounge on the Lawn at Midtown Park | Saturday, April 27 | FREE – Spend a day outdoors with friends and family when Midtown Houston hosts Lounge on the Lawn, an all-day celebration at Midtown Park. Activities will include yoga and dog yoga, a photo booth, caricature drawings, face painting, karaoke, and a movie screening of Black Panther. Noon to 8pm. Energy Corridor International Festival at Plazas in the Parkway | Saturday, April 27 | FREE – Join this celebration that will showcase the vast cultures that make up the community of Energy Corridor. Community members and local business will celebrate with live music, entertainment, and dance. There will be a market featuring a variety of cultural foods, fare, and other goods. There will also be giveaways and prizes. 2pm to 6pm. Sensory-Friendly Day at George Ranch Historical Park | Sunday, April 28 – The ranch swings open its doors to welcome families with children and adults with Autism Spectrum Disorders (ASD), as well as other sensory and developmental challenges, to explore the Park in a safe, structured, and enjoyable manner. This event will include modifications like Quiet Corners, Sensory Friendly Kits, noise-canceling headphones, and colored glasses to ensure a welcoming visit. Tickets are $15 for Adults; $10 children ages 4 to 15; free for 3 and under. 11am to 4pm. 7th Annual West Houston Food Truck Festival Sunday, April 28 – The West Houston Food Truck Festival returns for the seventh year, welcoming all to nosh and enjoy on the Temple Sinai campus. There will be music by Mixdoctors Mobile DJs, two bounce houses, and children’s activities including a balloon artist, face painting, and strolling magician, and an appearance by the Houston SWAT team. Tickets are $8 at the gate, not including food and beverage purchases. Noon to 4pm.